We have just finished building our latest 6m addition to our exhibition trailer hire fleet, just in time for it to be delivered to Blenheim Palace for its first outing. 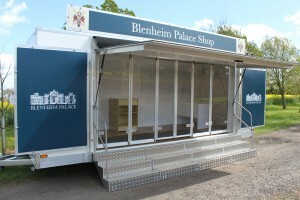 For prices and delivery times on exhibition trailer sales, call Lindsey on 01543 255452. This entry was posted on Monday, May 18th, 2015 at 5:14 pm	and is filed under Uncategorized. You can follow any responses to this entry through the RSS 2.0 feed.You can leave a response, or trackback from your own site.